When the phrase “application performance management (APM) made its first appearance on the technology scene early in the last decade, the applications that were most in demand for being instrumented were enterprise Java and .NET. Times have changed, as have the ways in which developers approach the science of application performance monitoring. AppDynamics aims to be the APM solution for the future. Calling itself the third generation of application performance management platforms, AppDynamics is endeavoring to move from simple APM into full-on application intelligence. 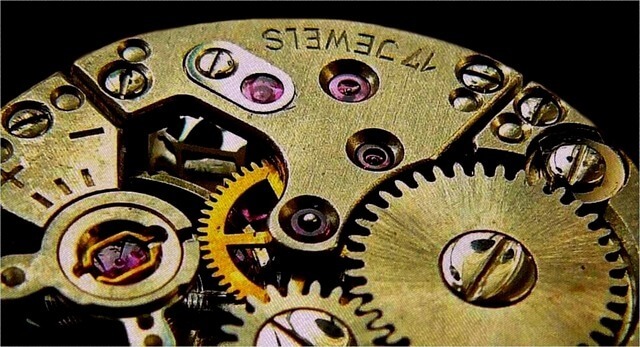 The company incrementally updates its monitoring platform four times a year, roughly for each season. The latest release is tagged Winter 16, which roughly corresponding to the winter in the northern hemisphere, and piles on the new features that help move forward the state of APM. The company has enhanced its unified monitoring to include more visibility into servers, and databases, as well as support for monitoring C and C++ applications. Administrators can now get detailed user session reports for both mobile and browser users. Application analytics has been expanded with a query language, for sussing out answers to nuanced questions. There can be no doubt that developers are looking for more than the traditional APM monitoring as today’s enterprises develop complex applications needing a detailed infrastructure to support them. AppDynamics saw 100 percent growth in 2014 and has on-boarded over 1,800 customers since its launch — Some of which include media giants Barclay’s and DirectTV. “Digital is transforming the way companies do business. Even with operation processes, every company is looking at how software and apps are driving infrastructure. It’s very important software works well,” said Kalyan Ramanathan, vice president of product marketing at AppDynamics. Regardless of how a customer accesses an application, businesses are putting more and more effort into ensuring digital experiences are exceptional. Applications have gotten more complex over the 15 years since APM first became an offering to developers. Delivering a truly outstanding experience to customers on mobile, web, and IoT products is doubly so, as each application often has a multitude of individual services bundled together to help achieve this user experience. Whether this takes the shape of multiple API calls, service mapping, or starting/stopping hundreds of individual containers when a function completes — this difficult structure makes monitoring application performance a daunting task. When working with databases, the complexity of application management rises. In SQL and noSQL and traditional data stores, the architecture is often deeply ingrained. 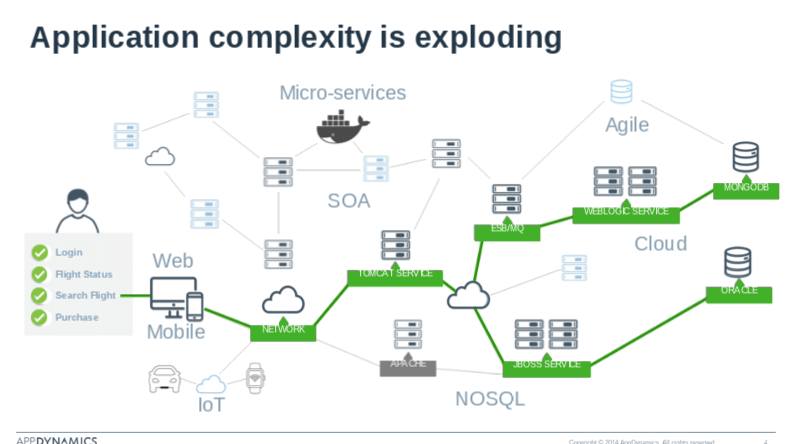 With the rise of microservices, applications have become more agile. As customers interact with an application throughout a series of interactions, IT managers may struggle with delivering a consistent experience to their users. Ramanathan notes that these business transactions are sent as individually from a client’s app, over a network, then to a third party API or backend application. “What AppDynamics does exceptionally well is discover business transactions, connecting the dots from end user to an app process on the back end. Once you have that, you can monitor and manage the performance of business transactions,” Ramanathan said. See: Allows developers to see end-to-end transactions. Know: Allows developers to understand the operational impact of a transaction. 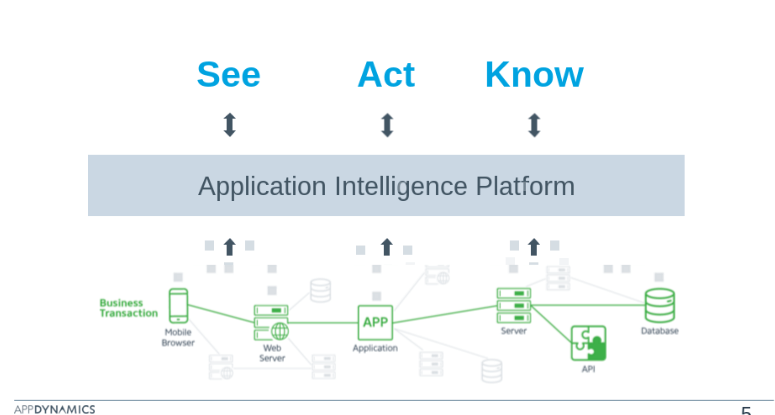 Ramanathan notes that AppDynamics logically connects all the steps a user takes within an application session into a singular instance. These unique sessions can then tell companies the performance of the session, and the customer’s path within it. This unified monitoring approach goes beyond synthetic monitoring to address all elements of an application in supporting the customer. AppDynamics has also extended its unified monitoring capability to support C and C++ apps, allowing developers extended support to server infrastructure for VMs. 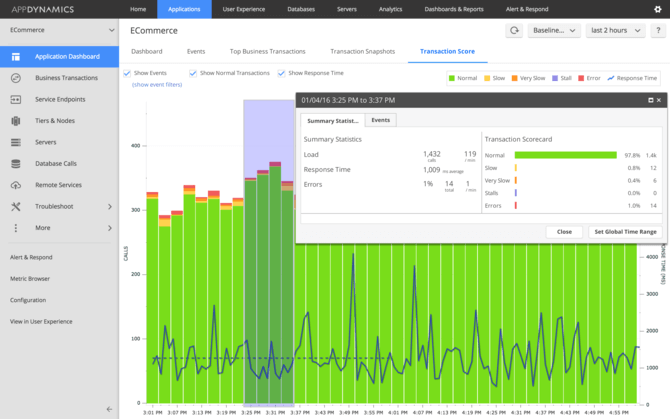 AppDynamics offers users 33 APM capabilities in all. These include datasets, integration for third party datasets, pulling to a database with third party APIs, the ability to write one’s own queries to analyze data, and additional visualization capabilities. Additional benefits include visibility into CPU/memory/server details from the application perspective, analysis as to how underlying pieces of a developer’s infrastructure are performing, and rich analytical capabilities. This information allows businesses to better analyze their data and begin to derive trends from it. As AppDynamics’ unified platform was built from the ground up, this massive undertaking allows for developers to simply install and set up the platform with a single line of code. AppDynamics primary goal in 2016 and beyond is to become the go-to solution for production monitoring and production analysis. This allows for customers to keep their overhead to a minimum while still having the same APM capabilities and allowing customers to map their business transactions. Ramanathan also noted business transactions are inherently a common language which should be managed. AppDynamics is available with a variety of deployment models, available both on-premises and in the cloud.